Home / Movie Database / Why Him? 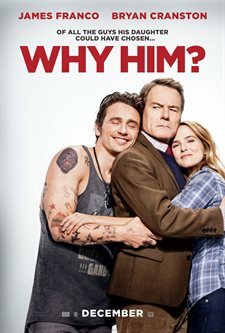 Download Why Him? in Digital HD from the iTunes store. Why Him? 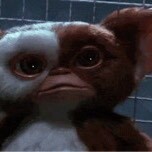 images are © 20th Century Fox. All Rights Reserved. Can you remember the first time you met your future in-laws? Or the first time your son or daughter brought home their new boyfriend/girlfriend? Hollywood has been playing on this theme over and over again from Guess Who's Coming To Dinner to Meet The Fockers. The latest addition to this grouping is Twentieth Century Fox's Why Him?, which hits theaters on December 23, 2016. Stephanie Fleming (Zoey Deutch; Dirty Grandpa) was always Daddy's girl. She and her father Ned (Bryan Cranston; Breaking Bad) had a tight bond even after she left home to attend college at Stanford University. Ned thought he knew everything that was going on in Stephanie's life until a skype call during his 55th birthday celebration gave him a rude awakening. Laird Mayhew (James Franco; 127 hours) is a 32-year-old, multi-millionaire who made his money from gaming apps. He lives in a huge house in California with animals of all kinds running around the yard. He also has a body full of tattoos and an extremely foul mouth. When Ned, his wife Barb (Megan Mullally; Will and Grace) and their son, Scotty (Griffin Gluck; Just Go with It), head to California to meet Stephanie's boyfriend Laird, Ned does everything he can to expose Laird as a fraud and try to get Stephanie to break up with him. Of course, Ned's plan doesn't go well and things fall apart rapidly. There is nothing new or earth shattering about Why Him? The story has been told a thousand times before and I'm sure this isn't the last time we will see it. The script is littered with curses that are so often unnecessary and just meant to shock the audience. It gets tiresome and, frankly, makes me feel as if the writers thought the audience couldn't handle anything more complicated. Or, maybe they just find curse words funny and figure the rest of the country should as well. The cast is ok for the most part. Cranston plays a character we've seen before from him (with the initials W.W.) and Franco is an obnoxious Gen X-er who is so unappealing. Admittedly, I don't particularly like James Franco so I'm not sure I would have praised him if he played the role any differently. Deutch is adequate, but I've seen this role from her before as well. The stand outs among the cast are Mullally and Keegan-Patrick Key (Keanu) as Gustav, Laird's obligator Ethnic "spiritual and moral" advisor. The latter is hilarious and able to morph himself into so many characters that you never know what you will get and the former reminds us why we loved her so much in Will and Grace. There was also a witty cameo from Kaley Cuoco (The Big Bang Theory) that add some humor. There is a built-in audience for this type of film and it will definitely make money this holiday season but, while it had a certain charm, it is more of what we've seen in the past with a high-tech bent and the latest "lingo". There were a few moments I laughed out loud but it only took me 10 minutes into the film to decide it was going to be really stupid. Sadly, the ending was also mostly predictable with Ned eventually caving and making peace with Laird. If you want to spend $10 to laugh a few times, then, by all means, plunk down your hard-earned cash for this movie. However, I would choose to opt for some of the more entertaining films that are out this holiday season and save this one for a Netflix rental.